BROOKLYN, NY. NY Bike Jumble, New York’s premier organization dedicated to the preservation and continuance of cycling culture across the five boroughs, and The Old Stone House, a vibrant community center dedicated to the history of Brooklyn, announce the opening of ‘Strong Backs, Weak Minds: The Saga of the Coney Island Velodrome’, a new exhibit detailing the history of New York’s last commercial velodrome in Coney Island. There’s more from the press-release below. The Coney Island Velodrome opened on July 19, 1930, as the world slipped toward the Great Depression and war. Already, the popularity of cycling, having peaked in the early 1920’s, was waning and the construction of a 10,000 seat bicycle racing arena was an act of supreme optimism. Regardless, the track became the last velodrome in America offering the thrills and chills of motor-paced racing, where riders raced behind motorcycles to attain speeds in excess of 50 miles per hour. 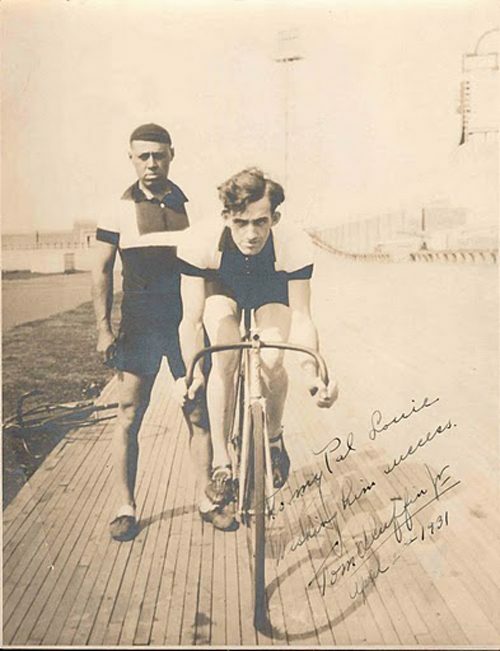 Many of the people who became instrumental in promoting cycling in New York in subsequent years cut their teeth on this track, and the Coney Island Velodrome was the last time in the city’s history where cycling was a indispensable part of daily life. Until today. As cycling has made an incredible comeback, this exhibition connects the past with the present, reminding New Yorkers that cycling has always been a fixture of our urban fabric. The exhibition, which runs through June 30th is open to the public, with a suggested $3 donation to The Old Stone House. Sundays, 11 am to 4 pm/call or check www.theoldstonehouse.org for additional public hours.